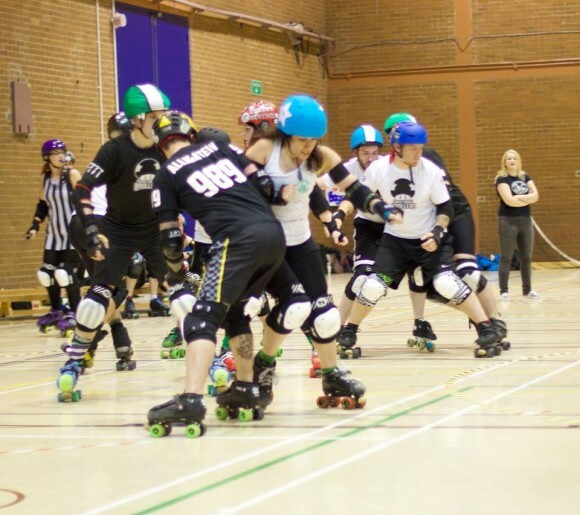 On August 23rd the Nottingham Roller Girls and the Super Smash Brollers battled it out at their first ever co-ed intra-league game at The University of Nottingham. Spectators saw Team Black take on Team White in an exhilarating show-down, following several weeks of anticipation and competitive banter between the two teams. The spectators were treated to an evening extravaganza of roller derby prowess, with the chance to have a beer or two , if desired! The event was organised to raise money for the league’s chosen charity, Equation, which seeks to prevent and respond to domestic abuse in Nottingham. The game got off to a thunderous start and the points soon began to rack up. Highlights of the first period included an impressive 15 points scored by Dark Side of the Boon. 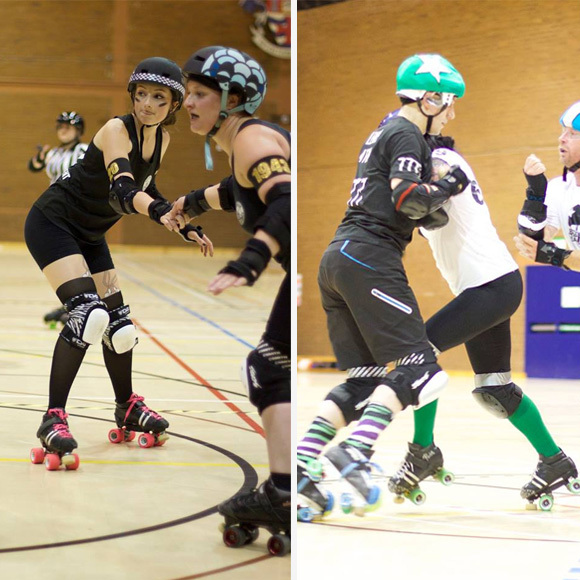 Hard hits from both Lozferatu of Team Black, and Sin Fiend of Team White, plus some nifty jammer-on-jammer action between Notts O’Gentle and Skate Plissken, added to the excitement of the game. The score at half time stood at 79 Team White – 61 Team Black. The second period saw some effective offence taking place with several book-ends from Team White to assist their jammer through some solid walls. A big hit from Feartrix Rotter sent Brawl Jukes flying across the track – and a power jam to Langlois saw him rack up the points for Team White. In summary, much fun was had by all – but more importantly the event managed to raise £283.75 for Equation. 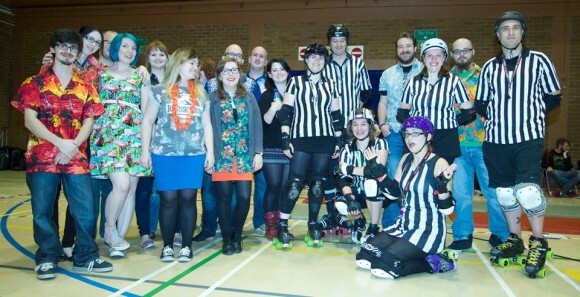 Special thanks to all the NSOs, referees and league members who helped make the evening a resounding success! This entry was posted in Events by Kat Chmee (ed). Bookmark the permalink.